In order to coordinate the time and place of departure, we’ll ask the youth to come to the Cairn unveiling ceremony in Wilmer on July 11. We’ll pitch tents (or sleep in the hall) and leave Wilmer at 6 a.m. on July 12 by bus and car pool. The hikers will return to Wilmer later that day, while the climbers will stay for two nights in the Bugaboos. The cost of transport and food will be covered by generous donors, and the teens need only bring their hiking boots and weather-proof clothing. For the climbers, we’ll provide ropes, and any necessary technical gear. It is imperative that all the invitees be physically fit, as the hike and climbs are strenuous and will last for many hours each day. It’s a couple hours drive to road’s end on Bugaboo Creek, and then takes around three hours to reach the hut on foot from there. We’ll stop by CMH’s Bugaboo Lodge for a brief visit to meet the lodge manager and see the historic collection of climbing photos and memorabilia that is on display. 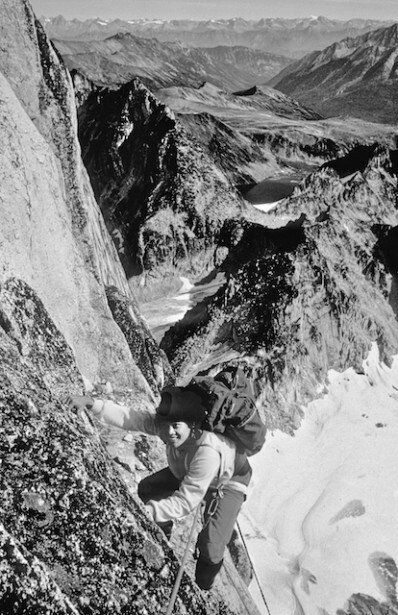 Deceased Austrian mountain guide Hans Gmoser, the key founder of CMH, was a great fan of Conrad Kain and built his first lodge here in full view of the Bugaboos. Depending on the weather, and our timing, we’ll proceed up to the site of Appleby campground, a 45 minute hike above the hut, for one of the best views in the Bugaboos. Throughout the day, the teens will be briefed on who Conrad Kain was, and from the various guides and CKCS/ACC members will hear some of the behind-the-scenes stories of his pioneering climbs in the Bugaboos and elsewhere in the Purcells and Rockies. The hikers will turn back when time runs out, and the climbers continue on to the top of one of the peaks above Appleby. That night, the climbers and guides will sleep in the hut, (courtesy of the ACC) while the hikers return to Invermere. For the next two days, we’ll aim for other peaks in the range, from Bugaboo to Pigeon Spire. We’ll experience the thrill of roped climbing on alpine rock, and learn how to traverse glaciers safely.